Taking your baby along on shopping trips is fun, but up to 72% of shopping carts are contaminated with nasty germs. If you're handy with a sewing machine, there's an easy solution. You can make your own adorable shopping cart cover to keep baby comfortable, safe, and healthy while you're out together. 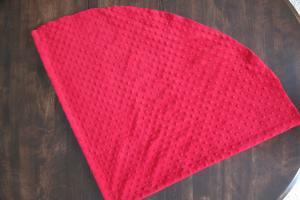 This cover is easy to sew and fun to customize. 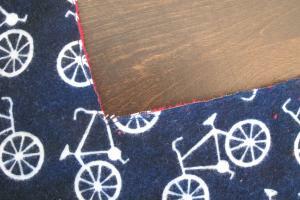 Choose adorable fabrics you love to give your cover a custom look. This cover design fits almost all shopping carts and even works to protect baby from dirty restaurant high chairs. It also makes a great gift. Expect to spend about three hours on this project. Prewash both fabrics, using the manufacturer's suggested settings. It's tempting to skip this step, but you'll need to be able to wash this cover. After they are dry, square up both fabrics. Cut your flannel to make a piece that's 54 inches long. Sew this piece to the remaining flannel to create a larger piece for your cover. 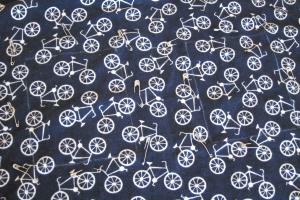 If you have a pattern on your flannel, you'll need about a yard of excess fabric to match the pattern. Fold the minky into quarters. 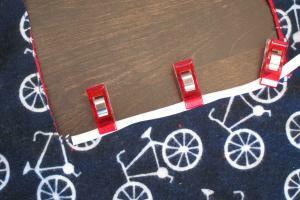 Use the measuring tape and dressmaker's pencil to make a mark 27 inches from the corner on each side. Then continue using the tape and pencil to create a quarter circle. Cut along the line you made. Fold the flannel on the seam you used to join it, and then fold again. 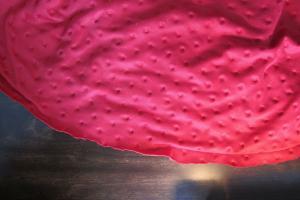 Lay the quarter-circle of folded minky on top of it, lining up the folded edges. Cut the flannel to match the minky. This doesn't have to be perfect, but it should be as neat as possible. Unfold the minky circle and place it face-up on your work surface. Place the flannel circle on top, face-down. Pin all the way around the edge of the circle. Using a stitch length of 2.5, sew almost all the way around the edge. Leave a six-inch space open for turning. Turn the cover right side out through this opening. Place binding clips along the edge to keep the two layers of fabric from shifting. 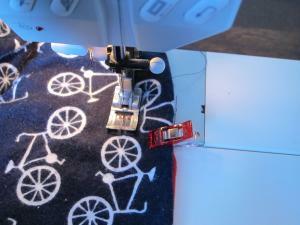 Adjust your sewing machine stitch length to 5.0. Top stitch all the way around the circle, one inch from the edge. Lay the cover flat on your work surface with the flannel side up. Locate the center seam. Measure down the seam 24 inches from one side toward the center. Make a mark with your dressmaker's pencil. Cut a piece of paper four inches wide by five inches tall. Lining the paper up with the mark you made, move it two inches to one side of the seam. Draw around it with the pencil. Move it two inches to the other side of the seam and repeat. Use safety pins to pin through both layers of fabric all the way around both of the rectangles you drew. Cut out the center of each rectangle. These will be the leg holes. Then measure 10 inches up from each leg hole and make a 1.5-inch slit for the seatbelt. Place binding clips around each leg hole to hold the piece in place. Using a 5.0 stitch length, sew right at the edge of each leg hole and slit to make sure the fabric layers stay together. Use binding clips to position the binding over the raw edges of the leg holes and along the raw edges of the seatbelt slits. Adjust your sewing machine stitch length to 3.5 and top stitch the binding in place. Cut the satin ribbon into two equal pieces. Fold each piece in half and pin it next to the seam, just above the leg openings. 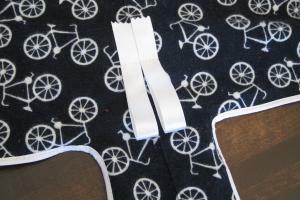 Sew both pieces to the cover for taggie toy loops. Place a safety pin on one end of the elastic. Thread the elastic through the opening in the edge of the cover, all the way around the circle. Sew the ends of the elastic together. Hand sew the opening closed using a slip stitch. Your cover is done. Making your own shopping cart cover can save you money over purchasing a cover from the store, and it also gives you unlimited options for customization. 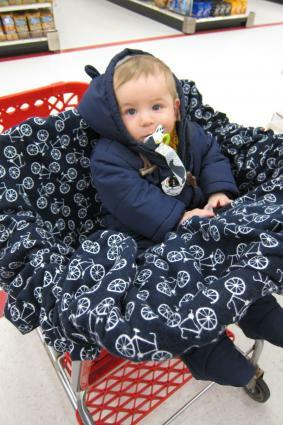 Choose fun fabrics to keep baby cozy and show off his or her personal style. You get to enjoy sewing for baby, and you may even receive a few compliments at the grocery store!